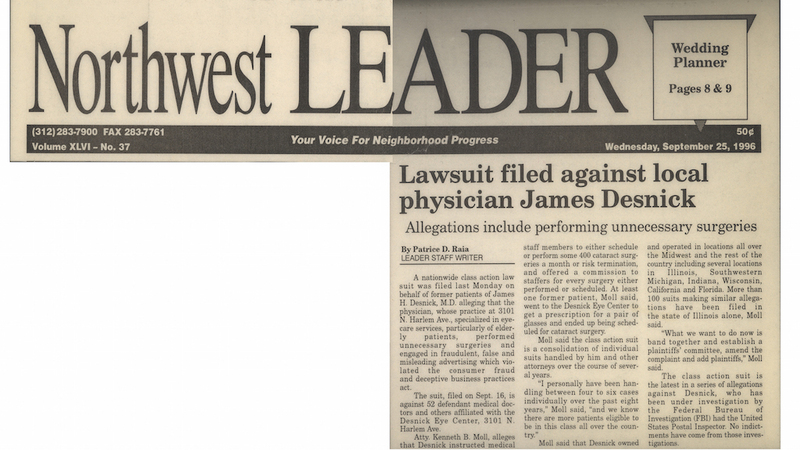 A nationwide class action lawsuit was filed last Monday on behalf of former patients of James H. Desnick, M.D. alleging that the physician, whose practice at 3101 N. Harlem Ave., specialized in eye-care services, particularly of elderly patients, performed unnecessary surgeries and engaged in fraudulent, false and misleading advertising which violated the consumer fraud and deceptive business practices act. The suit, filed on Sept.16, is against 52 defendant medical doctors and others affiliated with the Desnick Eye Center, 3101 N. Harlem Ave.
Atty. Kenneth B. Moll, alleges that Desnick instructed medical staff members to either schedule or perform some 400 cataract surgeries a month or risk termination, and offered a commission to staffers for every surgery either performed or scheduled. At least one former patient, Moll said, went to the Desnick Eye Center to get a prescription for a pair of glasses and ended up being scheduled for cataract surgery. Moll said the class action suit is a consolidation of individual suits handled by him and other attorneys over the course of several years. "I personally have been handling between four to six cases individually over the past eight years," Moll said, "and we know there are more patients eligible to be in this class all over the country." Moll said that Desnick owned and operated in locations all over the Midwest and the rest of the country including several locations in Illinois, Southwestern Michigan, Indiana, Wisconsin, California and Florida. More than 100 suits making similar allegations have been filed in the state of Illinois alone, Moll said. "What we want to do now is band together and establish a plaintiffs' committee, amend the complaint and add plaintiffs," Moll said. The class action suit is the latest in a series of allegations against Desnick, who has been under investigation by the Federal Bureau of Investigation (FBI) had (sic) the United States Postal Inspector. No indictments have come from those investigations.